Single Pressure Connection, Ranges Down to 10" w.c. 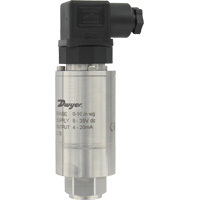 The Dwyer Series 672 Low Pressure Transducer is a perfect solution to any application where a very accurate low pressure transducer is necessary. Using variable capacitance technology, the Series 672 is designed to measure pressures as low as 10" w.c. up to 400" w.c., very low ranges for a single connection pressure transducer. The 672 also features a 0.25% F.S. accuracy. Use the Series 672 in liquid level, flood warning, waste water, clean room, and open channel flow applications. Wetted Materials: 318 Duplex SS, Ceramic, Fluoroelastomer (FKM). Housing Material: 318 Stainless Steel. Accuracy: ±0.25% F.S. (RSS). Includes non-linearity, hysteresis, and non-repeatability.Stability:0.25% F.S./1 year. Temperature Limits: -40 to 212°F (-40 to 100°C). Compensated Temperature Limits: -5 to 140°F (-20 to 60°C). hermal Effects:Zero: 1.0%F.S./100°F (2.0%F.S./100°C); Span: 1.0%F.S./100°F (2.0%F.S./100°C). Power Requirements: 4-20 mA: 9-35 VDC; 0-5 VDC: 7.5-35 VDC. Output Signal: 4-20 mA (2-wire) or 0-5 VDC (3-wire). Zero & Span Adjustment: ±10% F.S. each (by Potentiometer). Max Loop Resistance: 1.325 kΩ. Electrical Connections: Large DIN 43650 connector with mating plug. Process Connection: 1/4"-18 NPT male. Enclosure Rating: NEMA 4X (IP65). Weight: 11.6 oz (330 g). Low pressure transducer, 0-10" w.c., 4-20 mA output. Low pressure transducer, 0-15" w.c., 4-20 mA output. Low pressure transducer, 0-25" w.c., 4-20 mA output. Low pressure transducer, 0-50" w.c., 4-20 mA output. Low pressure transducer, 0-100" w.c., 4-20 mA output. Low pressure transducer, 0-150" w.c., 4-20 mA output. Low pressure transducer, 0-200" w.c., 4-20 mA output. Low pressure transducer, 0-300" w.c., 4-20 mA output. Low pressure transducer, 0-400" w.c., 4-20 mA output.